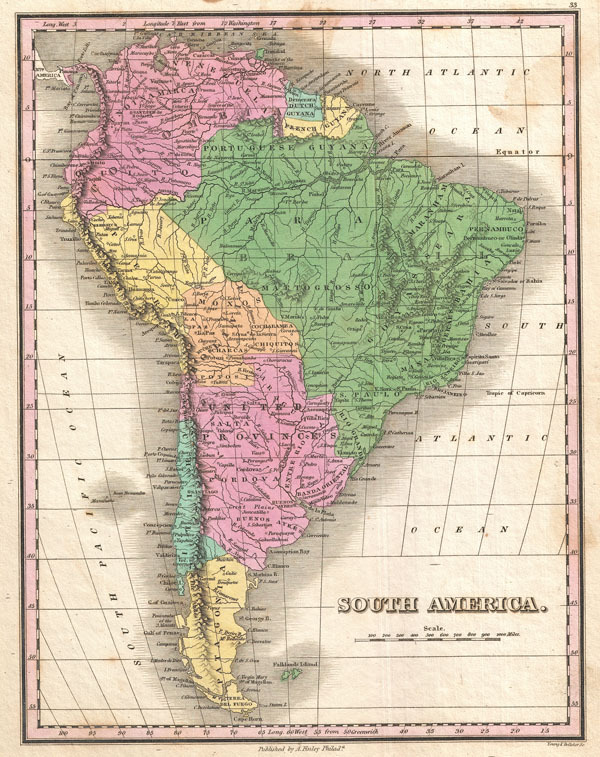 A beautiful example of Finley's 1827 map of South America. Covers the continent in its entirety from the Caribbean to Cape Horn. In Finley's classic minimalist style, this map identifies cities, river systems, and mountains. Offers some curious inland details including the highly dubious 'Source of the Orinoco.' Color coded according to regional national boundaries. Title and scale in lower right quadrant. Engraved by Young and Delleker for the 1827 edition of Anthony Finley's General Atlas. Rumsey 0285.034 (1831 edition). Phillips (Atlases) 4314, 760, 752, 6045.